It’s not easy choosing the right venue to host kids parties: You want to pick a place that offers children fun and entertainment, while not being too strenuous on the adults. For families in and around Morganville, NJ, the choice is clear: New Jersey Circus Center. On the popular review site for parents, MommyPoppins, the clowning and tumbling experts were rated as the Number One venue for kids parties in the entire state! And it's no wonder - between the unique circus activities and the fun atmosphere, your children will talk about this party for years to come. 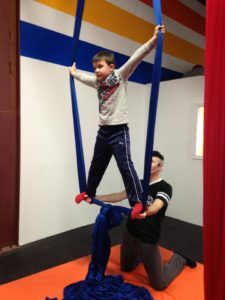 Circus Training: From ground and aerial training, to group obstacle courses, children will have a blast, while developing new skills and building confidence. Kids have the opportunity to see what it takes to be in the circus, while taking juggling or tumbling classes! Great Service: The circus experts here offer fantastic service. All they require from you is that you provide food and cake for the party. They handle everything else, including the activities, beverages, and setup. They even have a refrigerator and freezer, if it is more convenient to drop food off in advance. Additional Options: Party packages allow parents to choose fun options that provide a unique experience for the kids. These options include face painting, a magic show, gift bags, and t-shirts. This way you ensure your little ones spend their time with the options they love most! This highly-rated venue will keep your children active and entertained in a safe and controlled environment. Though it’s highly sought for kids parties, The New Jersey Circus Center is great for adults too. From fitness training to circus workouts, the activities are as challenging as they are fun and rewarding. Call to schedule your party today at (732) 705-3244 or visit their website to view their birthday package.